Shah & Co. stands in the midst of the most renowned Bag Closer Machine suppliers, in the market. We offer two models of bag closing machine, which are single thread model and double thread model. We have indulge ourselves in importing only top quality machines thus placing us among the top bag closing machinery importers, located in India. 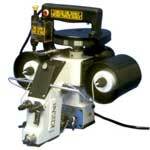 Our bag closing machines are accessible at the most competitive prices. Bag Closers are actually handy sewing machines. Their principal purpose and work is to close bags. Hence the name Bag Closers. The portability of the machine allows one to stitch wherever the bags are lined up or wherever the bag filling is going on - hence fast packing and convenience. other applications besides closing bags. Textiles for joining long layers of cloth - before they go for processing /dyeing. But that's not all the real versatility of the machine comes up where it can be used in countless Or any other application where long lengths of material / cloth have to be stitched / joined in a small working area.